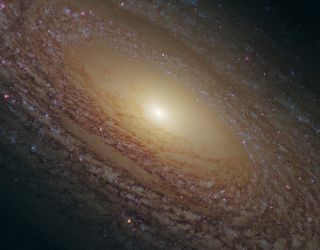 The galaxy NGC 2841 — shown here in a Hubble image — currently has a relatively low star formation rate compared to other spirals. It is one of several nearby galaxies that have been chosen for a new study, in which scientists are observing a variety of different stellar nursery environments and birth rates. A stunning new photo from the Hubble Space Telescope shows newborn stars studding a galaxy like bright blue jewels. The spiral galaxy, called NGC 2841, lies in the constellation Ursa Major, about 46 million light-years from Earth. Hubble's newest instrument, the Wide Field Camera 3 (WFC3), took the photo, in which newborn stars show up as bright blue clumps. While the image shows lots of hot, young stars in NGC 2841's disk, there are just a few sites where hydrogen gas is currently collapsing into new stars, researchers said. It is likely that these fiery youngsters destroyed the star-forming regions in which they formed. The photo of NGC 2841 is part of a new study to better understand and characterize star formation throughout the universe, researchers said. Scientists are observing a variety of different stellar nursery environments to try to answer some key questions. Astronomers don’t understand, for example, how the properties of stellar nurseries vary according to the composition and density of the gas that is present. They're also not sure what triggers star formation in the first place, researchers said. The driving force behind star formation is particularly unclear for a type of galaxy called a flocculent spiral, which is characterized by short spiral arms rather than prominent and well-defined galactic limbs. NGC 2841 is such a galaxy. An international team of astronomers is using the WFC3 instrument to study a sample of nearby — but substantially different — star-forming regions. The observational targets include both star clusters and galaxies, researchers said, and star-birthing rates range from the baby-booming starburst galaxy Messier 82 to the much less active NGC 2841. WFC3 was installed on Hubble in May 2009. The instrument is well suited to carry out the new study, researchers said, as the camera is optimized to observe the ultraviolet radiation emitted by newborn stars. It also sees well at infrared wavelengths, so it can peer behind the veil of dust that would otherwise hide the youngsters from view. Hubble, a joint effort of NASA and the European Space Agency, launched in April 1990. The telescope has been repaired five times over its long life, and it's expected to keep going strong until at least 2014.